At AAA Heating & Cooling, we offer repair and maintenance services for commercial heating units in Portland and Vancouver. We’re here to help with any malfunctions and routine service checks you need for your commercial furnace. In addition, we can help with installation or design of a new furnace system. The durable commercial furnaces and HVAC systems from AAA Heating & Cooling are designed to provide reliable climate control for businesses. However, some commercial heating units will become less dependable over time. Common commercial furnace repair problems may include a heating unit that won’t turn on, less efficient heating, lack of warm air, poor indoor air quality, strange noises coming from the unit or ducts, unusually high heating bills, or unresponsiveness from the thermostat control panel. 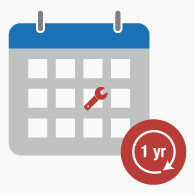 If the heating bills for your business are suddenly unusually high, it’s a good idea to schedule maintenance for your furnace. AAA will clean, tighten, adjust and lubricate all the necessary components of your commercial heating unit. This will improve efficiency and lower your heating bills. You may notice a faint burning smell when your furnace turns on for the first time in the fall, which is normal. However, any rotten or electrical burning odors should not be ignored. In either case, you’ll want to schedule an air duct cleaning or electrical repair with an HVAC expert. If you notice that the air quality is declining in your commercial space, or you don’t feel a steady stream of air when the furnace is on, it’s a good idea to call an expert for a filter change. The best way to prevent malfunctions with your commercial heating unit is with regular maintenance. Yearly one-time maintenance is recommended for professional HVAC service on commercial furnaces. In addition, installing a programmable thermostat that will turn off at night will allow you to avoid high heating bills. Lastly, make sure all heating vents are not obstructed by rugs or furniture. This will improve airflow in your commercial space. At AAA Heating & Cooling, we are prepared to install, service and troubleshoot any commercial HVAC system in the Portland and Vancouver metropolitan areas. We are licensed, insured and ready to get the job done. For more information on repairs and maintenance for commercial heating units, contact us today!